All Visitors Welcome especially Anglers, Holidayers, and Astronomers. Self-Catering holiday Cottages and Caravans and facilities suitable for many different types of holiday. Within the central fishery lodge building is an empty stable which is suitable for the temporary storage of equipment and gear and is shared by our visitors. We have storage facilities large enough to hold several cycles or loads of fishing tackle. We are situated near to the coast (see here for directions) and we are open all year. There are several walks and walking routes on our door step. The Coastal walk is a couple of miles away. Like the walks there are also several Cycling routes in the locality and one right outside. At night there is no light pollution with the darkest, clearest skies. The Milky Way cloud and myriad of stars can be seen with the naked eye as can the many satellites that travel across the sky at about 8 minute intervals. We are at the Northern End of the "Welsh Triangle" and occasionally UFO's have been seen including one exceptionally large one at night in October 2006. Our grounds are a haven for all sorts of bird life from Woodpeckers, tree creepers, Finches, Kites and Buzzards through to Kingfishers. 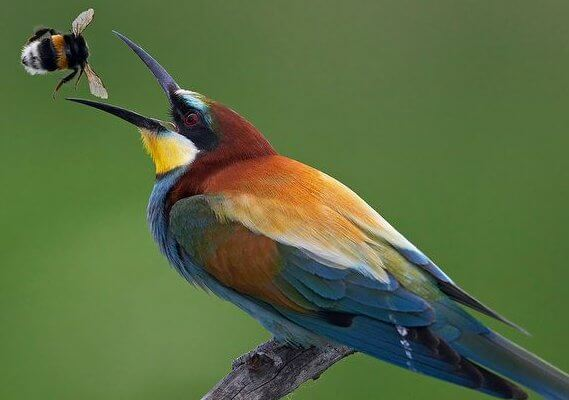 Also, the occasional European visitor bird such as a European Bee-Eater bird (Merops apiaster or Gwybedog y Gwenyn)! A colourful wanderer from southern Europe, last known confirmed sighting at New Cross on 21st June 1993, a couple of miles from our location. At night and in the early hours Badgers, Foxes etc. can be seen and provided you move quietly and slowly you should be able to watch the Badgers foraging close to you. Besides the animal life we also have plenty of plant life from early Snowdrops and Bluebells, wild orchids and lots of yellow flag iris all in a naturally beautiful setting. We are one of the prettiest fisheries and also a top fishery with a good variety of clean, fighting fit Coarse Fish and Trout, where even the smallest fish thinks it’s a 7lb’er and never knows when to give up! Overall a place definitely worth a visit and an excellent place to stay whether for a fishing holiday, a family holiday or an activity holiday. For photographs of the accommodation, more “fishy” pics and more, please take a look in our photo Gallery >here.